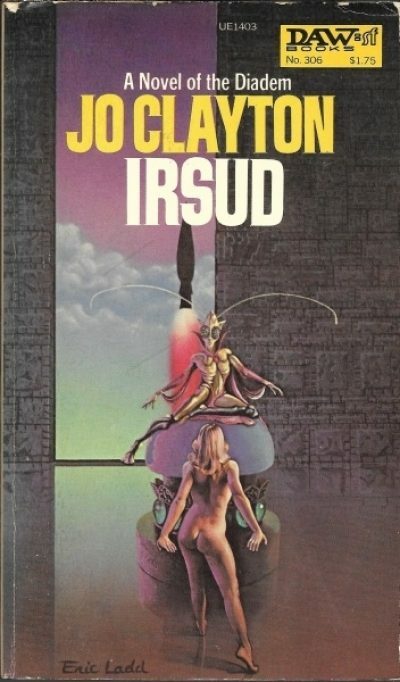 1978’s Irsud is the third volume in Jo Clayton’s Diadem series. Two volumes ago, Aleytys, the red-haired and occasionally clothed bearer of the diadem, a strange artifact imbued with the minds of previous bearers, managed to find a way off her backward homeworld. Alas, she is no closer to finding her mother’s world. Volume two ended on a cliffhanger: Aleytys’ baby stolen and Aleytys herself sold to aliens. Aliens with an … um … parasitic wasp life cycle. I am afraid things will be getting worse for Aleytys before they get better. The nayid queen has very specific requirements for the host for her final egg, the one that will be the queen’s next mortal incarnation. Like wasps, the nayid larvae use their hosts as food. Unlike wasps, the aliens borrow genetic material from their doomed host. The queen wants her next self to have prodigious psi powers. Aleytys, whose psionic powers are remarkable, is a close to ideal host. Not quite ideal, because Aleytys simply refuses to accept that she will be slowly eaten over the next year by an alien larvae. Although the process is painless, and although she is trapped deep in the heart of her owner’s territory, Aleytys is determined to rid herself of the parasite, escape slavery, and flee the planet. Not even an alien lover of considerable talent can dissuade her of her odd desire to be free and uneaten. As the alien queen will discover, the downside of ruthless tyranny is that your victims may follow a suitable leader (when one appears) and revolt. The downside of demanding that one’s egg-bearer be a psychic of tremendous power is that they are a psychic of tremendous power. And while you may slap a psionic damper on your victim, machines, like dynasties, eventually fail…. Dig that 1970s cover! By an artist named Ladd, no less. I have done some casual research into Disco Era DAW art and my conclusion is that his artists must have believed that Wollheim was keen on well-formed unclad buttocks. See, for example, the cover of the second book in this series. Aleytys gets to wear pants on the cover of the next book. The main problem with the plotting in this book is that Aleytys was already fairly formidable even before she acquired the diadem. Once she has donned it, any conflict between her and the queen should be a one-sided curb-stomp. To keep her from using her full range of powers, the author keeps her protagonist drugged, dampened, despondent, and distracted by her alien lover. And when need be, the victim of bad luck. Once Aleytys regains her balance…..
People for whom sexual assault is a trigger will want to avoid this book and the series in general. This volume takes that theme into what amounts to forced impregnation. Readers may note the similarity between the nayid appropriation of host characteristics and the way that the Alien-franchise xenomorphs do much the same thing: Irsud predates Alien by a year. This is the fifth Clayton I have read, the third with an unrequested impregnation, and the second where a good part of the plot centers on a character’s desire to rid themselves of an unwanted internal passenger. Five books is a small sample but I wonder if Clayton was something of an outlier for her time in that she was willing to write about pregnancy and abortion. Aleytys has not made much if any progress in her quest to find her mother’s people. Still, the series ended with book nine, Quester’s Endgame . The title at least seems promising. I am astounded to discover Irsud has a Open Road edition! And unlike my copy, this version can be left cover up on a table without inviting comment.